In View From a Height, the acclaimed science writer Isaac Asimov examines the fields of biology, chemistry, physics, and astronomy, and with clarity and wisdom integrates them into the larger fabric of science as a whole. Along the way, he entrances and enlightens the reader with fascinating inquiries into a host of provocative topics: the marvelous neutrino (an atomic particle with no mass and no charge), the recipe for the planet Earth (in an intriguing discussion of the earth’s crust), the changing concepts of Time in a world of split-split-split seconds, life-as-we-don’t-know it (in which Dr. Asimov expands our biochemical concepts of life), the physical dimensions of man (Among Earth’s animals, are we pygmies or giants? ), and much more. Here is a book of facts—wide-ranging, delightfully comprehensible, and thoroughly entertaining—which captures the beauty and excitement of science. The amazing Dr. Asimov has always tried to look at science from a lofty vantage point, the better to see the many-faceted designs of Nature that today’s narrow specialists often miss. In View From a Height, he succees brilliantly. “Not As We Know It” is a good examination of the real possibilities for non-carbon based life. I love the ending of “Recipe for a Planet,” and “Superficially Speaking” provides an interesting perspective on the colonization of space. And “Order! Order!” and ”The Modern Demonology” are solid expositions of entropy. 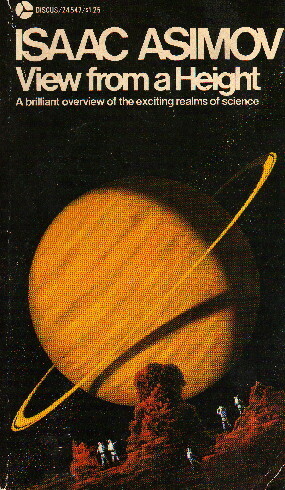 The two key essays here, however, are “The Height of Up” and “Hot Stuff.” The former—a speculation as to just how “hot” anything might be able to get in reality— brought out a response from Hong Yee Chiu, who tried to be a bit more rigid than Asimov had an ultimately changed his field of study to encompass the hottest entities in the real universe: supernovae. Chiu’s work is summarized in “Hot Stuff.” It turns out that Chiu’s theories as to supernova formation are wrong, but the fact remains that Asimov was enormously proud of the fact that it was his essay that got Chiu to do work in the field in the first place. Although his own work as a scientist was of little note, the work that others did as a result of reading his books was not, and it was a point in which he took considerable (and legitimate) pride.